You’re all probably aware of your cardiovascular system, as heart disease is still the number one cause of death in the modern world. And you’re probably well-versed in the goings-on of your digestive system, what with all the focus on probiotics, prebiotics, and now synbiotics. But how many of you know about the lymphatic system – what it does, how to improve it, and so forth? This may come as a shock to you, but your lymphatic system may be even more important than those other two above combined. Now is that exaggeration? Yes, probably so. But as you’ll soon see, not by much. What is Your Lymphatic System? Your lymphatic system is actually part of another famous system in your body, your immune system, which means it also helps to protect you against illness, disease, and the inflammation responsible for much of that illness and disease. In particular, your lymphatic system specializes in combating outside threats like bacteria and infections. Your lymph system includes glands like your tonsils and adenoids – the glands at the back of your nose that helps protect your lungs and digestive system. And it includes organs, such as your spleen and thymus. Your lymphatic system is a drainage system, comprised of blood vessels and lymph nodes that carry fluids around your body, from your tissues to your blood stream and vice versa. It’s similar to your circulatory system, except that it carries lymph instead of blood. And, in fact, your lymphatic system is where your white blood cells are produced and stored. And in case you’re wondering, lymph is a watery, clear liquid, made up of salts, glucose, protein molecules, bacteria and other substances. 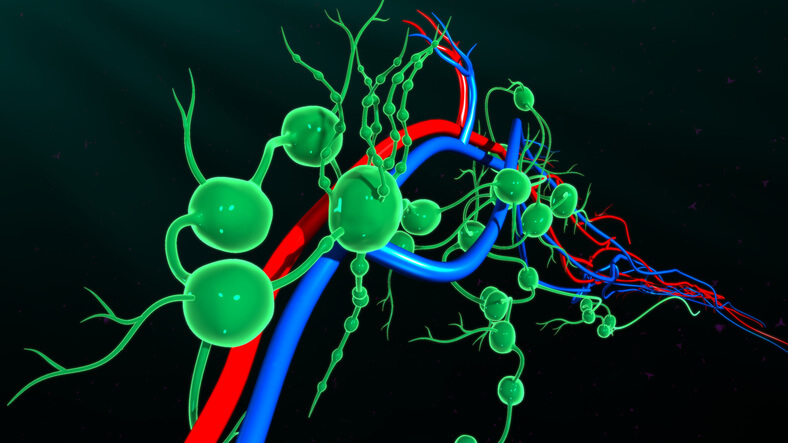 Why is a Healthy Lymphatic System Important? Your lymphatic system is responsible for removing cellular debris and toxins from your body. It can become easily congested, especially as a result of a sedentary lifestyle, which weakens immune function and thus hinders our ability to fight illness and disease. To make matters worse, your lymphatic system doesn’t have a pump in the way your circulatory system does. Instead, it relies on movement and stimulation to work properly. And when it’s not functioning as it should, those toxins that were supposed to exit the body get trapped in your lymph nodes instead. You’ve all probably experienced swollen lymph nodes before when you were sick. This is normal. Your lymph nodes are where your immune system finds, attacks, and attempts to destroy all perceived threats. They also filter out bacteria and produce disease-fighting white blood cells. If there’s congestion, not only do you experience mild symptoms like bloating, headaches, stiffness, and skin problems, but your body will likely experience toxic overload, which can lead to a host of problems. In turn, your lymph nodes will have a harder time doing its job, when it comes to producing those white blood cells that keep your immunity strong. The good news is that there are a wide range of strategies for getting your lymph circulating as it should. By utilizing certain exercises, massage, dry skin brushing, and adapting your diet to include a few select foods and herbs, you’ll have your lymphatic system in tip-top shape before you know it. And trust us, you’ll feel the difference. By far the best exercise to get your lymph circulating again is also a fun and easy exercise, and how often do you hear that as it pertains to getting healthier. It’s called rebounding, and it has nothing to do with basketball. A rebounder only takes up a small amount of space, as opposed to the full-grown outdoor trampoline, and only 10 minutes a day will produce fantastic results. But any type of movement and exercise will benefit your lymphatic system. Other good options include high intensity interval training, yoga, even walking. Just remember, if you’re stagnant, your lymphatic system will likely be as well. Many of your lymph nodes are located just under your skin, which means stimulating those areas will improve your lymphatic circulation and drainage. Dry skin brushing helps get rid of dead skin cells, of which we have millions, if not billions, just sitting on top of our skin. As you might imagine, this can cause a traffic jam of sorts, as one part of your body responsible for the elimination of toxins is your skin. Toxins that don’t exit the body through your skin can be reabsorbed by the body, or even contribute to cellulite. Dry skin brushing is an invigorating experience, it allows your skin to breathe and look its healthiest, and it even relieves stress. Lymphatic massage is another great way to manipulate your body into circulating more lymph. Unlike a bruising Thai massage, lymphatic massages are gentle, as you’re merely rubbing or pushing the skin in the direction of the lymphatic flow. You can see a specialist for this type of massage, or you can learn do it on yourself, particularly areas you can reach like around your face, which will help with sinus congestion. Lymphatic massages are also a great natural remedy for fibromyalgia, migraines, improving range of motion after surgery, and as a treatment for reducing cellulite. Getting healthy is as much about what you eliminate as what you add. So, let’s start with eliminating the bad. And first on the list is no food before bedtime, at least three hours. Eating before bedtime handicaps your lymphatic system by giving it too much to do during a period when you’ll be doing very little. Milk and milk products are another lymphatic clogging culprit. As are sugars, hydronated oils, and refined foods or processed foods. Flavonoids are high on the list of what to add, as they have an augmenting function on your lymphatic system. So, aim to get more fruits, vegetables, and herbs into your diet, particularly those with deep, dark colors. Some that deserve special mention are red clover, echinacea, goldenseal, and ginseng. Cucumber juice, in particular, will help purify your lymphatic system. And don’t discount hydration in general, which is vital. And when we say, hydration, we’re referring to more clean, pure water, not diet soda. Herbal teas are also a great option, but not as a water substitute. In general, you want to get more alkalising foods and herbs into your diet. And red foods are particularly beneficial for your lymphatic system, which makes beets an excellent vegetable choice. Remember, your lymphatic system is responsible for improving your immunity to disease and illness, and unlike most systems in your body, it really needs your help to be at its best. Which means getting up and moving around more. And actually, that’s good advice in general.